I've always loved the drawings my children do. I find around five the best age by far on the cute scale. 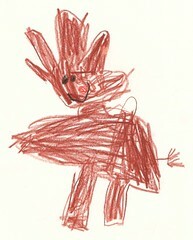 Take this one Léon did today of Rudolph the red-nosed reindeer. The hairdo is his idea of antlers, the red nose is carefully hidden in the brown and the half drunk-looking smile is just priceless. The body-shape is funny given it is meant to be front-on. He asked me halfway through if reindeer had tails before carefully adding the fluffy appendage to the right. But my favourite part has to be the legs. I pointed out when he showed me it that reindeer had four legs. He looked at me as if I was daft and said 'I know, that's his front two, you can't see the back ones because they are behind the front two'.